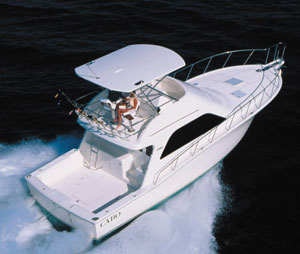 With a hard top helm enclosure, the new Cabo 40 HTX makes all-weather boating and fishing a pleasure. 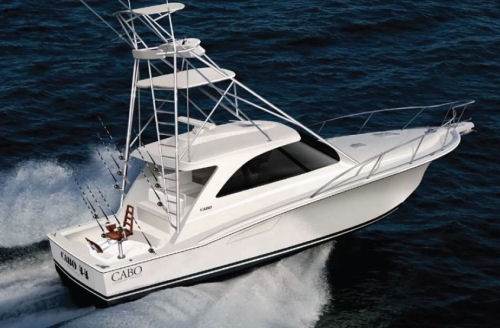 Following on the success of the Cabo 44 HTX, the Cabo 40 HTX brings a smaller, less expensive sibling to the Cabo Yachts hard top express sportfishing boat mix. Why put that big, beefy enclosure around the helm? 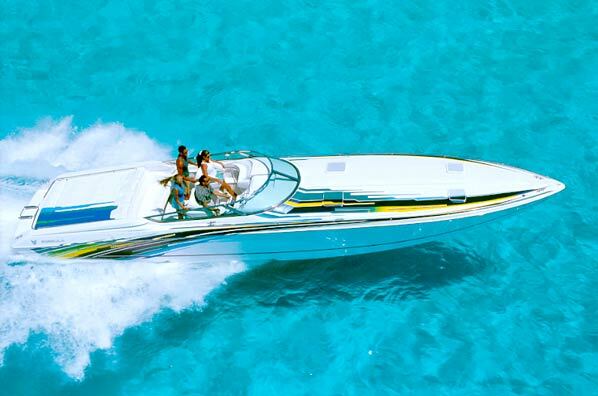 For all boaters, being able to take a break from the weather is welcome. And for northerners, an enclosure like this could extend your fishing season by months. Yet you’ll still get to enjoy the convenience and easy cockpit access of the express lay-out. 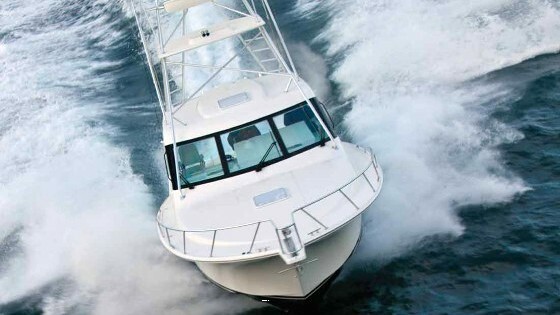 Few express boats can offer complete protection at the helm, and that's the idea behind the Cabo HTX models. Getting out from under that hard top and into the cockpit is, of course, when you’ll have the most fun. 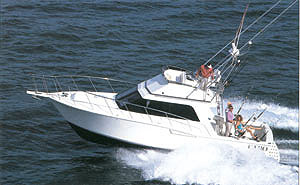 Like other Cabos the cockpit on the 40 HTX is designed for fishing, fishing, and more fishing. 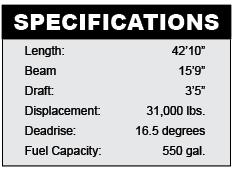 There’s a whopping-big 48-gallon livewell in the transom, a pair of macerated tuna-sized fishboxes integrated into the deck (fit them out with chiller plates, and you’ll be done hauling ice), a bait prep station, tackle stowage drawers, and coaming bolsters ringing the inwales. 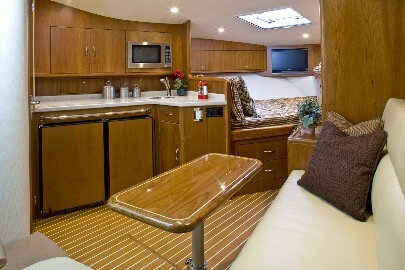 Get those baits set, grab a tall frosty drink, and get ready to watch ‘em in comfort—there’s also an aft-facing bait-watcher’s seat with a flip-down footrest in the cockpit, on the back of the helmdeck passenger’s chair. 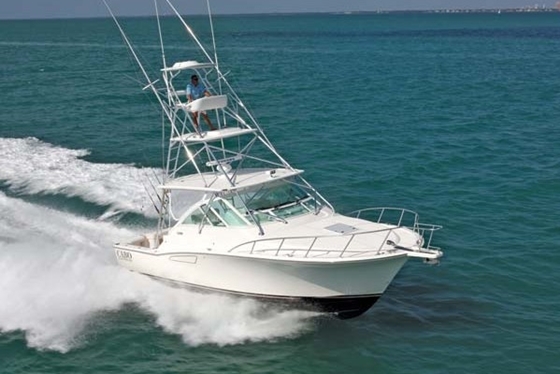 If you decide to sit back there while you’re cruising out to the fishing grounds, you’d better hold on tight—rigged with the 1,001 maximum horsepower Caterpillar C18 ACERTS, top-end speeds will break 40-mph. Several power options are available, though, including both inboard and pod drive options, ranging down to 600-hp powerplants. Rigged with Caterpillar C18 ACERTs, the 40 HTX can hit speeds of 40 MPH. 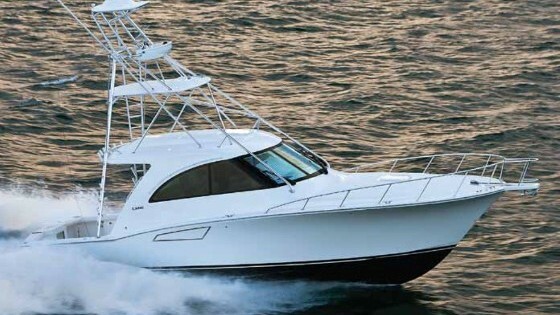 Like other Cabos, when you set those horses free in a strong head-sea, a combination of hefty displacement—in this case, 31,000 pounds—and good hull design will quell the blows. Transom deadrise is 16.5 degrees, which isn’t incredibly steep for a boat of this size, but ensures good stability when drifting baits in the trough. And stout construction backs up the design; Cabo makes good use of vinylester resins, biaxial stitched fabrics, vacuum-bagging, and aluminum reinforcement in that hard top. All of the hose fittings are guarded by double clamps, and one of the engines is fitted with a crash pump. But the best construction highlight has to be the boat’s wiring. Cabo is known for ram-rod straight wiring runs, good labeling, and perfect looming, and the 40 HTX is no exception. Want the convenience of an express layout, and the full protection of a hard top? 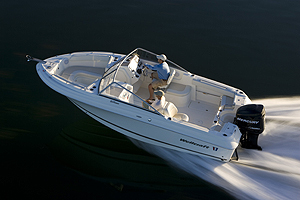 This boat brings it—in a smaller, less expensive package. 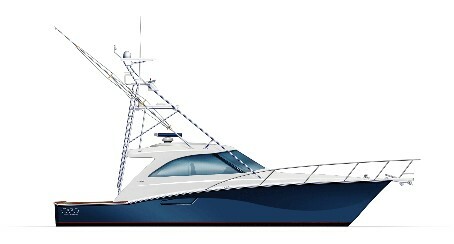 For more information, visit Cabo Yachts.